The Northeastern University School of Law chapter of the National Lawyers Guild (NUSL NLG) supports the Northeastern chapter of Students for Justice in Palestine (SJP) and formally opposes the administration’s decision to suspend the group and sanction its members. NUSL NLG is committed to the protection of civil rights and civil liberties, and stands for the elimination of oppression and marginalization based on race, ethnicity, national origin, gender, gender identity/expression, sexual orientation, ability, class background, religion, and political viewpoint. We believe in fostering free and open political dialogue among community members from diverse backgrounds and experiences. The unwarranted sanctioning of SJP represents suppression of student speech and a decision to selectively silence pro-Palestinian political expression. This is one incident in a disturbing pattern of similar retaliation against pro-Palestinian organizing on campuses across the country. As members of NLG and as members of the Northeastern community, we oppose this gross violation of students’ fundamental right to freedom of expression. We urge the University to align its behavior and policies with the rights guaranteed by the Constitution, as interpreted by the United States Supreme Court. Criticism of Israel is not directed at Jewish students or Jewish people but, rather, the perceived misconduct of the State of Israel. To treat the two as equivalent implies that Jewish people or Jewish students around the world are culpable for Israel’s treatment of the Palestinians on the basis of their shared religion or perceived shared ethnic and ancestral characteristics. That notion itself is anti-Semitic. Furthermore, we oppose the use of the NU Police Department (NUPD) to investigate, intimidate and harass students with unpopular political opinions. We are especially concerned that the police decided to target two SJP members who are young women of color, and who are not in leadership or decision-making positions within SJP. We are not surprised by the NUPD’s actions; communities of color have experienced profiling for decades, and NUPD is not immune to such social ills. Additionally, history has shown that those involved in liberatory political struggles always face harassment, infiltration, surveillance, beatings, imprisonment, torture, and even murder, at the hands of the police. We are concerned that the Northeastern administration and NUPD are unduly influenced by wealthy donors who are vocal in their support for Israel and their opposition to pro-Palestinian expression. Robert Shillman, the multi-millionaire CEO of Cognex Corporation, is an NU alumni who paid for the construction of Shillman Hall (and, presumably, the prominently displayed statue of himself and his cat). He is also a major supporter of the David Horowitz Freedom Center (which back-funded right-wing Islamophobic extremists Robert Spencer and Pamela Geller), and the Zionist Organization of America (ZOA). ZOA is a right-wing organization that supports unrestricted Israeli settlements on occupied land, a major obstacle to the peace process condemned by the United Nations. ZOA names Shillman as a “devoted Zionist” and a “major supporter” who sponsors students’ access to ZOA fundraising events. Last July, ZOA wrote a lengthy letter to University President Joseph Aoun, demanding an investigation into three esteemed professors for their academic critiques of Israeli policy, a review of course material to ensure it adhered to pro-Israel ideology, and that the school punish pro-Palestinian activists for political activities both on and off campus. In the response to emails sent to Northeastern officials in support of SJP, Michael Armini, Senior Vice President of External Affairs, made several disingenuous statements that obfuscate the real issues. First, Armini’s email said that SJP leaders have not been permanently banned from participation in SJP. However, the March 7, 2014 letter from Jason Campbell-Foster, Director of the Center for Student Involvement, informing the SJP president and treasurer of the suspension, states that if SJP is reinstated on a probationary status as a recognized student organization after December 31, 2014, “no current member of the Students for Justice in Palestine executive board may serve on the inaugural board of the new organization.” Thus, the issue of whether or not the leaders have been banned from participating is beside the point; they are banned from serving as leaders. This strikes us as an attempt by the University to weaken and discourage SJP in their vital work of opposing US-backed Israeli policy in the occupied Palestinian territories. Second, Armini also disingenuously stated that SJP has had many opportunities to discuss its conduct with University officials. This is not an accurate statement. In order for SJP to have the chance to discuss their conduct, the University must first notify and formally charge SJP with distributing flyers, which did not occur. In fact, SJP has never been granted a hearing nor an opportunity to contest the charges related to the mock eviction action, nor has the University provided SJP with the evidence used as the basis for the allegations. SJP outlines the flawed process in some detail in their appeal of their suspension. Regarding the mock eviction notices, we have trouble believing that Northeastern students would seriously think their dorm was to be demolished in three days. The flyer was explicitly and obviously a piece of creative political agitprop, reading in big, bold letters, “This is not a real eviction notice. 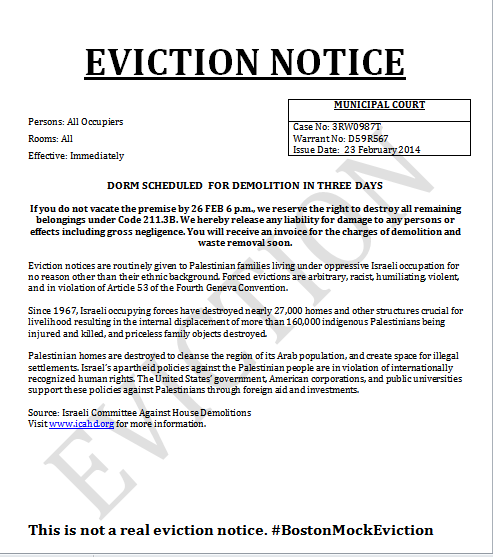 #BostonMockEviction.” Other writing in the mock eviction notice also made it clear that it was meant to raise awareness about the plight of Palestinians. Third, Michael Armini disingenuously stated, “reports that expulsion procedures have been initiated against students affiliated with SJP are false.” This misses the point entirely. The Office of Student Conduct and Conflict Resolution summons sent to the two students made explicit mention of a “level 1” Code of Conduct violation, and the penalties for such a violation include expulsion. While expulsion procedures may not yet have been initiated, once students have been charged with such a violation, the University has the option to initiate expulsion procedures at their own discretion and at any moment. The students subjected to those charges are therefore forced to fear the worst due to an incredibly non-transparent process. Fortunately, and perhaps not in small part due to unrelenting pressure by SJP supporters all across the world (and perhaps due to the realization that the charges were disproportionate to the allegations asserted), as well as a flood of mainstream and BDS movement-affiliated media attention, Northeastern University has wisely decided that the students are no longer facing the possibility of expulsion. We encourage Northeastern University to continue down this path and realize that discrimination against a particular point of view is unsound, unwarranted, and unjust. 1. Reinstate SJP as a student organization with all of the appropriate privileges thereof. 2. Ensure that SJP is no longer held to a more stringent standard than other organizations and receives the appropriate support offered to other student organizations. 3. Take appropriate measures to ensure that all student organizations are able to engage the University community in open discussion, without having their views politically censored. 4. Immediately cease the use of the NUPD to investigate student organizations for exercising their speech rights. We look forward to working with the University and all student organizations to create a community where the right to the free expression of political speech can be exercised without fear of suppression. At the same time, it is important that groups such as ZOA and APT not be allowed to marginalize politically oppressed student groups through hate speech. To that end, we ask the University to adopt a more comprehensive hate speech policy that provides for transformative justice, anti-oppression training and, at the prerogative of the victim, disciplinary action. Healy v. James, 408 U.S. 169, 180 (1972). Keyishian v. Bd. of Regents of Univ. of N.Y., 385 U.S. 589, 603 (1967). Snyder v. Phelps, 131 S.Ct. 1207, 1219 (2011). Id. at 1215; see, e.g., Connick v. Myers, 461 U.S. 138, 145 (1983). Federal law states that “[n]o person in the United States shall, on the ground of race, color, or national origin, be excluded from participation in, be denied the benefits of, or be subjected to discrimination under any program or activity receiving Federal financial assistance.” 42 U.S.C. § 2000d (“Title VI of the Civil Rights Act”). Thus even private universities that receive federal funding have a legal obligation to prevent the creation of a hostile environment for students based on race, ethnicity, or national origin. See http://palestinelegalsupport.org/download/advocacy-documents/NLG_Students_Rights_1011.pdf. See Michael Armini’s March 12, 2014 email, available at http://www.northeasternsjp.org/updates.html. See SJP’s March 14, 2014, email to Emily Hardman, Director of Student Programming & Communications, available athttp://www.northeasternsjp.org/updates.html. The mock eviction notice is available at https://pbs.twimg.com/media/BhfsQHPCcAAHpnx.png. Other posts by Northeastern University School of Law chapter of the National Lawyers Guild. klarman – a big ugly fat sociopathically arrogant disgustingly wealthy zionist. shillman? i couldn’t help but laugh when it said nu has a statue of him and his cat.